While we were in Florida, I picked up a whole new load of candy making stuff- mostly Wilton. Actually, I think all of it was Wilton! I got peanut butter flavour and dark chocolate candy melts, a new candy mould, some squeezy bottle things, and some decorating brushes. 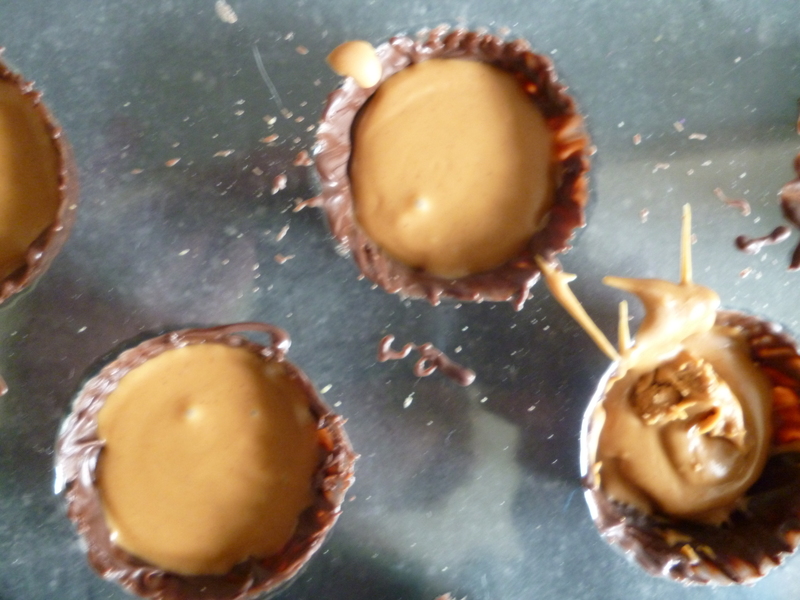 Making peanut butter cups meant I got to use EVERYTHING. The squeezy bottle things say you can half fill them with Candy Melts, then place the bottle in a bowl of hot water until they melt. Well yeah, sure, that sounds simple enough. Except the bottles are still light and half full of air, so the just float- you end up having to hold the bottle in the water! And then, (because you’re trying to keep it so the water can’t get in) all the melted candy is at the bottom, and it takes aaages to work its way to the nozzle when you’re ready to start, by which time it’s cooled a bit and is reluctant to come out. Bah. Bah!! It still took a while, but at least I could leave it where it was for a bit. You do have to keep sqidging the bottle a bit to make sure it’s melting right the way through. Anyway, onto filling the cups. This took a lot longer than the old dolloping-in-with-a-spoon method, and in the end I gave up and reverted back to my old ways- which were quicker, but a heck of a lot messier! This entry was posted in Baking, Chocolates, Tutorial and tagged Candy Melts, Peanut Butter Cups, Wilton. Bookmark the permalink. Post a comment or leave a trackback: Trackback URL. They look amazing! I love peanut butter, you must make some next time you come up here!